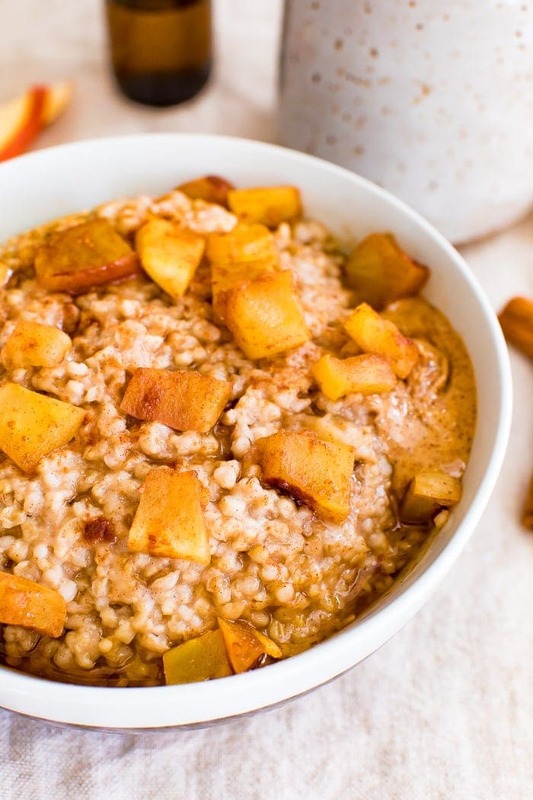 Apple cinnamon oatmeal made with steel cut oats and filled with soft apple chunks. 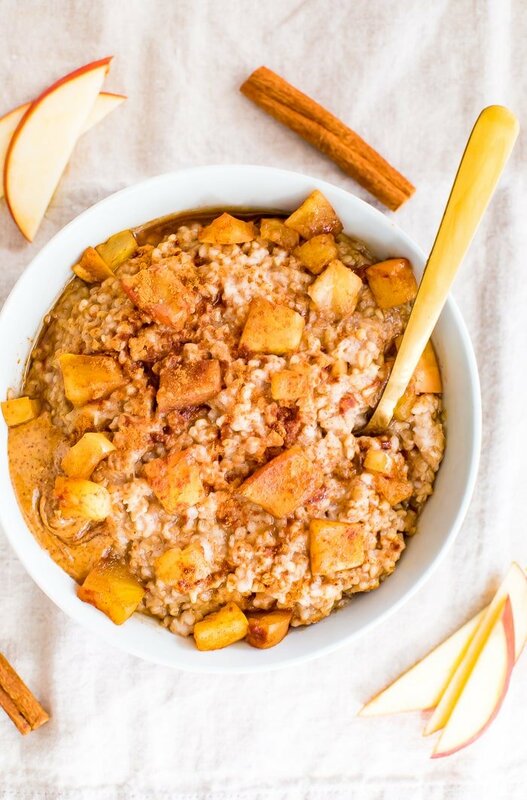 You can make this apple cinnamon oatmeal in your slow cooker or an instant pot! Tuesday, October 29 is National Oatmeal Day! Needless to say, this a holiday I’m happy to celebrate because I love oatmeal and have a ton of healthy oatmeal recipes to prove it. On Tuesday night I made a big batch of steel cut apple cinnamon oatmeal in my slow cooker. I’ve made overnight steel-cut oats on the stove top before, but never cooked them in my slow cooker so I was apprehensive about how it would turn out. I put the ingredients for the apple cinnamon oatmeal together and started the slow cooker around 10PM, went to bed and upon waking up at 6AM, our house smelled like baked apples and my oats were perfectly cooked and waiting for me to dig in — quite a lovely circumstance to wake up to if you ask me. The only thing I needed to whip up was a pot of coffee. 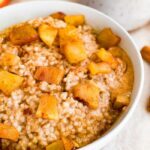 These apple cinnamon steel cut oats are oh so creamy and I love the chunks of cooked apples and warm cinnamon spiciness. 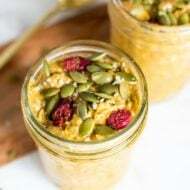 The recipe makes four servings of oatmeal so you can share with others (this would be great for a holiday brunch) or use it as a meal prep recipe and save the leftover oatmeal for a quick breakfast throughout the week — just let the leftover oatmeal cool and place in the refrigerator for up to one week. Simply reheat the oatmeal on the stove top or in the microwave. Just add a little water or milk when reheating if it’s too thick. The best part? 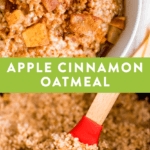 I’ve tested this apple cinnamon oatmeal recipe in the slow cooker and the Instant Pot so I’m giving instructions for both within the recipe! I note this in the recipe, but the big difference between cooking the apple cinnamon oatmeal in the slow cooker and the Instant Pot is the amount of liquid. For the slow cooker you need 4 cups of liquid and for the Instant Pot you only need 2 cups. It can be water or almond milk, whichever you prefer. Almond milk will make for creamier oatmeal. 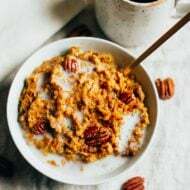 As always, if you try this apple cinnamon oatmeal recipe please be sure to leave a comment letting me know how it turned out. 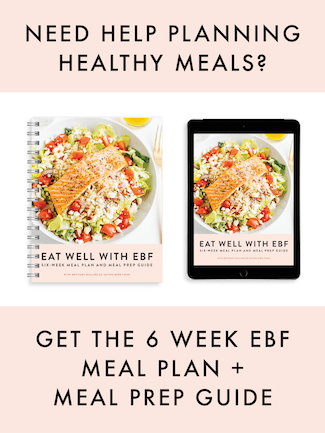 Your feedback is so helpful for the EBF team and other readers! For the slow cooker: Coat slow cooker with cooking spray, butter or coconut oil. Add all the ingredients besides the toppings into slow cooker and mix well. Cook on low for 6-8 hours. Place in a bowl to serve and sprinkle on toppings of choice. For the Instant Pot: Add all ingredients except almond milk and toppings into your Instant Pot. Cover with the lid and turn the vent to “sealing.” Press the manual button and set time to 4 minutes on high pressure. The Instant Pot will automatically start. Once done cooking, allow the pressure to naturally release. Once all the pressure has released carefully remove the lid and stir the oatmeal and serve. For leftovers: Let the oatmeal cool and place in a sealed container in the fridge for up to a week. You can reheat the oatmeal on the stovetop or microwave. Just add a little additional milk to loosen the oatmeal, if needed. The big difference between cooking the apple cinnamon oatmeal in the slow cooker and the Instant Pot is the amount of liquid. For the slow cooker you need 4 cups of liquid and for the Instant Pot you only need 2 cups. It can be water or almond milk, whichever you prefer. Almond milk will make for creamier oatmeal. 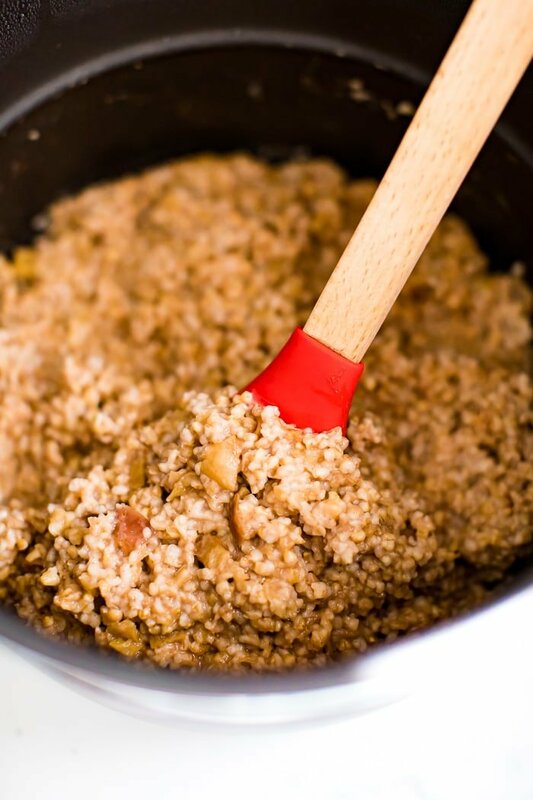 Love steel-cut oats in the crockpot and I also love having breakfast made that lasts a week. 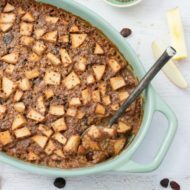 I have a blueberry banana crockpot steel-cut oat recipe on my blog, but I bet apples would be taste and smell wonderful! Happy Halloween! Yum! This looks so good and I’ve always wanted to try making oats in the crockpot! I love all of the ingredients, so I just might try this recipe this weekend! Thanks Melissa! Let me know what you think if you do end up trying it. Yum this looks delicious! I have only made oats one time in the crock pot and they were plain, but still turned out delicious! I will have to give this recipe a try very soon as the temperatures are dropping! Hi Brittany, This recipe sounds like a winner. I am going to make it soon and enjoy all week. Hope all is well with you, Isaac, Olive and your family. The pics of your little nephew were really cute! Looks delicious and so easy! Do you think I could substitute rolled oats if I don’t habe steel cut oats on hand? Hey Tiffany, I don’t think rolled oats would work well because they cook so much faster than steel cut oats. I was just searching your site to find a recipe for slow cooker oats! Perfect timing! I will be doubling this to make for breakfast at a girls’ weekend tomorrow. Thanks so much! Awesome Mary! Let me know how it turns out. I have almost the exact same recipe on my blog, just slightly different. So good! It’s really good substituting the apples for mashed banana too. It tastes just like banana bread. Oh yum! I used to always use half of a banana when making regular oats on the stove top so I can imagine how good they would taste in the slow cooker steel-cut oats. I’ll have to try that next time. This looks perfect for a cold blustery fall morning. I am definitely making this for breakfast this week. Thanks! whoa… that looks AMAZING!!! I am making this very soon!!! I made this recipe yesterday and it came out just ok. I greased the crock pot with coconut oil and the oats ended up sticking to and burning the bottom and sides of the pot. 🙁 I’ll try it again, because my family still enjoyed it, but it was not fun to clean the mess. Next time I’ll grease with cooking spray. Oh no! I’m sorry yo hear that Monica. I’ve heard this happening before with overnight cooked oats in the crock pot — it could be that they cooked for too long or that they were cooked at too high of heat. I hope they turn out better next time. Thanks for the advice! This was my first attempt at crockpot oats, so I wonder if it’s just the timing… I did use the low setting but maybe it went too long. They cooked right at 8 hrs, so will try 6 for the next batch. To make cleanup super easy, use the crock pot liners from Reynolds. ( http://www.amazon.com/Reynolds-Metals-00504-Cooker-Liners/dp/B00578EKRY/ref=pd_sim_hpc_2 ) I don’t use my crock pot without them anymore! Just had to pop in this am and let you know, I was inspired by this recipe to purchase a small slow cooker and make this. Woke up to this yummey goodness this am! Thank you Peg. I’m so glad that you enjoyed the steel cut oats! Thanks for reading and trying my recipes. I made this recipe this weekend and it was perfect on a chilly morning. I even had some leftover to bring to work this morning! Thanks for the great recipe! Any tips on baking this in my oven? Can this be made only with milk instead of milk and water ? Delicious! I did substitute 2% milk for the almond milk because that’s what I had, and omitted the sweetener. I will definitely make this again and will share it with my friends. Can’t wait to try it. My family will love it. Thank you Andrew. Let me know what you think if you try the recipe. I’m so glad you found my blog. Turned out great. We didn’t have steel cut so it got a little mushy. But, the kids & I loved it. Great to wake up to a warm meal ready to go. We make an overnight oats in the warm months with our B’more Organic Vanilla skyr in the ‘fried. So, this is a wonderful version for the colder months. Hi there, this recipe sounds great! I am going to give it a try tonight and double it up. Do you think it would freeze well? Just put this in the crockpot for the morning, I can’t wait to see how it turns out. Thanks! Hi. I just made this and it was great! I have lots of leftovers. I know I can freeze them but j was wondering if anyone knew a way to.use them in something such as cookies or muffins. Found this page through Google. U tried it last night & it must have been good because there was no more when i got up. My daughter ate two servings. I did use less water by 1/2 cup and I added craisins before starting the cooker. Thanks for the recipe. I made this last week, and I’m making it again tonight. So delicious and easy!! Thank you so much for this recipe! I’m not a good guesser when it comes to what size crock pot a recipe was cooked in. Could you please post that? I’m thinking 2qt but I’ve been wrong before. Thank you. It looks delicious! Hi Lauri, I cooked this in a 6 qt crockpot. Anyone have nutritional info. for this recipe (as prepared above, minus any toppings)? Need it to convert to WW Plus points. Do you peel the apples? I like to include skins when I can (for nutrition) but I’m not sure if it will work well in this recipe. As an update I did not peel the apples and it was great. The skin just gave it a little crunch. I also used sweetened almond milk (it was all I had in the fridge) and skipped the sweetener and maple syrup and it still came out really tastey. I would rate the recipe 5 stars but my phone is being silly about it. Hi Kelly. I’m so sorry I missed your first comment. I didn’t peel the apples either. I like the extra crunch too. So glad you enjoyed the recipe. Hi! This looks fantastic! 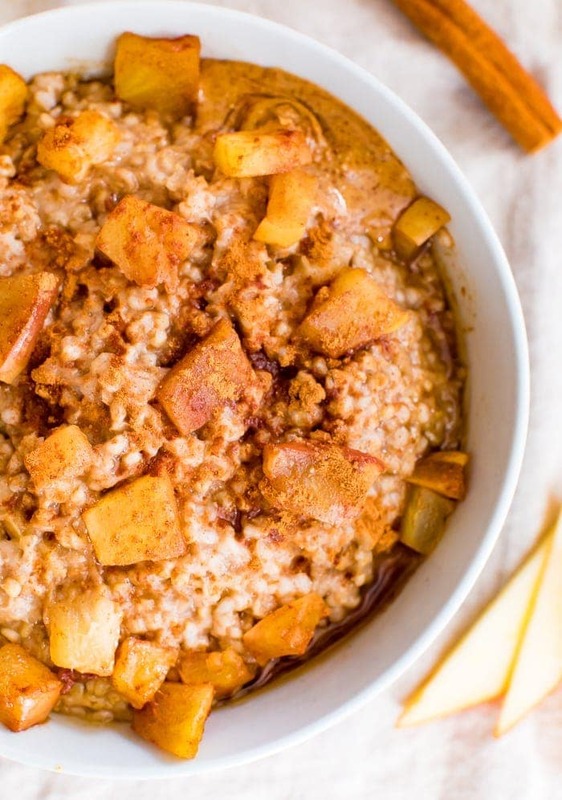 We have a slow cooker that I need to use more often and am going to give this a whirl today – I’m just wondering: My family recipe for apple oatmeal includes shredding the apple and throwing it in the pot – do you think I could do that here or would it release too much of the apple juice? The recipe we use (I think??) cuts down on the milk to allow for the apples to cook more in their own juice but I’d really like to not screw this up! I don’t have a basis for “normal” liquid ratios in steel cut oats so I’m wondering if you think I could get away with shredding the apple. Hi Elizabeth. The recipe calls for 1 cup of apple pieces. I think it would be fine if you used shredded apple instead! I hope it turns out well for you! I just finished making this recipe. Can barely wait to taste in the morning. Have recently changes my diet to include healthier food. This seems healthy and filling! Will let you know the outcome. Thanks! Yay! I hope it made your Sunday morning extra delicious. My doctor said I needed to quit eating my highly processed, heavily sugared maple brown sugar oatmeal, so I gave this a try. As I ate a bowl his morning, I went from “well, it’s okay” to “steel cut oatmeal, where have you been all my life?” Thanks for posting the recipe! if you would post nutrition values, that would also be a big help. Thank you. I enjoyed this today with a red pear instead of apple. And I didn’t have stevia so I added an extra half tablespoon of maple syrup instead and that resulted in the right level of sweetness for me. Also because the last time I made steel cut oats in the Instant Pot I thought they were too hard, I added an extra half cup of liquid and the texture was more to my liking. Thanks for another great recipe!